Finger joints, also called box joints, add visually striking symmetrical design to corner assemblies. Unlike dovetails, finger joints do not interlock mechanically but their enormous glue surface area makes them as strong as dovetails throughout the life of todays modern adhesives. 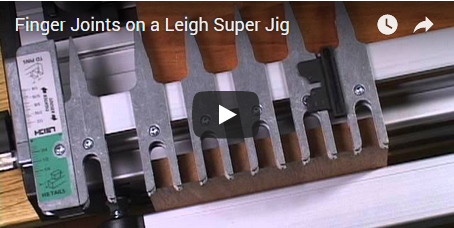 Leighs versatile 16" F1600 Finger Joint Template is the most comprehensive and accurate jig of its kind. The F1600 produces eight sizes of precisely fitted box joints: 1/16", 1/8", 3/16, 1/4", 3/8", 3/4", 1/2" and 1", and can also produce three sizes of square half-blind joints. Leigh's unique VGS guidebush system, provided with the F1600 Template, guarantees you can make every joint fit flawlessly. Joint fit is easily and precisely controlled using Leigh's patented Variable Guidebush System (VGS), a unique adjustable 3-piece template guidebush. Rotating the barrel of the VGS, up or down, increases or decreases its active diameter. A 1/8 turn of the barrel adjusts joint fit by a mere 1/1000 of an inch! The VGS comes standard with every F1600 Template, as do three tapered guides, one for each comb size. The VGS mounts directly to many router bases. Some routers may require a Leigh template guidebush adaptor. See Guidebush Chart. How to Select The Right Bits for Finger Joints. 3 sizes of square half-blind: 1/4", 3/8", 1/2"
F1600M 16" Metric Finger Joint Template with 8mm, 10mm and 12mm combs. Possible joint sizes include 2mm, 4mm, 6mm, 8mm, 10mm, and 12mm. A procedure outlined in a technical support bulletin also allows double and triple sized joints. The metric F1600 Finger Joint Template is a completely separate product. It has three guide combs instead of four and uses metric-sized cutters. Only order this product if you have metric cutters and suitable router collets. Leigh does not stock or sell metric cutters. Joint size and board width:8mm x 260mm wide, 10mm x 340mm wide and 12mm x 600mm wide. Features 5 two-flute solid carbide spiral upcut bits and 1 single-flute HSS (162). Set includes bits 162 (1/16"), 164C (1/8"), 166C (3/16"), 168C (1/4"), 173C (3/8)", 180C (1/2"), and collet reducer 172-375 (1/2" to 3/8").